About "A Piece of Pi"
A Piece of Pi, for solo violin, was written to celebrate Pi Day at Trinity School in New York City several years ago. Inspired by dynamic math teachers, the students at Trinity hold an annual Pi Day celebration on March 14 and in 2008 I was asked if I would compose a piece that included Pi. My students assisted by converting five hundred decimal places of Pi into corresponding chromatic scale notes. To create the music I had to use a set of pitches and rests as a framework for the composition. I really enjoyed the decisions and challenges involved and I was delighted to find a sequence of notes that matched the theme John Williams used in his movie score for Close Encounters of the Third Kind. I couldn't resist quoting those five notes with musical accents as a homage to Mr. Williams. Since the first performance at Trinity school in 2008 the piece has been performed at several math symposia, in a recital of contemporary composers at Peabody Conservatory a doctoral candidate, as part of a of a Pi Day celebration in Poland, and in several New York City schools. It has received media attention, most notably, through Agence France-Presse and The Huffington Post. ​I am happy to have had many requests for the sheet music and I am pleased that the piece is now published by Ovation Press, an online music publisher. If you enjoy this piece and specifically, if you perform it, please let me know. * March 14th is Albert Einstein's Birthday! 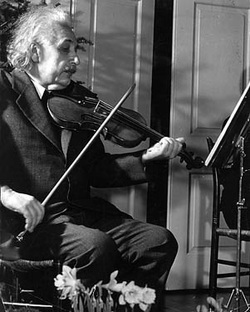 * Albert Einstein played the violin! * Pi as a piece of music for solo violin! * Would Einstein have played this piece? Purchase "A Piece of Pi"
​To get the sheet music, here is a link to Ovation Press - the music will be printed from your own printer!